Aid agencies in Haiti's flooded north-west say there is a "critical lack" of food and water in an area already facing the threat of disease. Yolette Etienne of Oxfam told the BBC 300,000 people are affected. "They have lost everything - their houses, their families," she said. Supplies are starting to get through, although flood waters are still hampering the progress of trucks. UN Secretary General Kofi Annan is urging donors to give more aid. Unicef has issued a "flash appeal" for $1.5m (£830,000), and the International Federation of Red Cross and Red Crescent Societies for $3.3m (£1.8m) to fund relief operations. The Red Cross says the European Union and Venezuela were among the biggest contributors so far, but more was needed. The contamination of water supplies by rotting human and animal corpses was the greatest danger, said Gordon Weiss, emergencies spokesman at Unicef. "What we fear most is the spread of water-borne diseases - they can kill children very quickly," he told BBC News Online. The distribution of clean water, purification chemicals, oral rehydration salts, basic medical supplies and replacement school materials was the priority for Unicef, he said. Time was critical, said Ms Etienne of Oxfam, because some areas of the country had still not been reached by the aid agencies. "During this weekend we hope to get through to other forgotten areas, not just in Gonaives but also Port-au-Paix," she told BBC radio's Today programme. She said Oxfam had been promised money by the EU, and that the relief organisation Care International was hoping to secure funds from the American government's USAid, "but I can't say if it will be sufficient to face this big catastrophe". 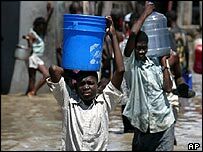 With several major floods in Haiti this year, agencies have blamed the cutting down of forests to provide charcoal for fuel, and said the country was in need of a longer-term solution. "When you remove vegetation, the topsoil washes away. The earth isn't capable of absorbing rainfall," said Rick Perera of Care. His organisation is promoting alternative energy use to reduce the dependence on charcoal, which is still used for 71% of the country's energy. USAid says it has planted 60 million trees in Haiti over the past 20 years, but that poor Haitians chop down 10 to 20 million each year.